The foes we will never forget. This piece is part of a series of articles that ran in PC Gamer UK issue 326celebrating Baldur's Gate, 20 years on. We'll be posting more in the next few weeks. For more quality articles about all things PC gaming, you can subscribe now in the UK and the US. When BioWare designed Baldur’s Gate in 1998, it already had almost 25 years of D&D history to draw from. The result is one of the most varied and exciting bestiaries in rpG history. across the two games and their expansions, the Bhaalspawn battles all manner of dreadful beasts, from trifling kobolds and rats, to powerful mind flayers and beholders. and it’s in these encounters where the game’s real-time-with-pause combat comes to life, forcing you to think carefully about how to slay each foe. There’s plenty of sword fodder in Baldur’s Gate. You can slice through the kobolds in the Nashkel Mines without breaking a sweat. But it’s when a more formidable enemy confronts you that you have to pause the game and have a good old rummage through your party’s abilities. Mind flayers, a D&D favourite, are squid-faced monsters who can mess with your mind, draining your intelligence to the point where if it reaches zero you die instantly. And to make matters worse, they’re often accompanied by umber hulks: giant, ugly insectoid creatures that can inflict confusion. But the beauty of Baldur’s Gate is that, thanks to the depth of its combat, even the most powerful enemies can be outsmarted by a clever player. Mind flayers can drain Intelligence, but what if the thing they’re attacking has no Intelligence to drain? Cast the Animate Dead spell to send a horde of mindless skeletons to attack. But that’s just one solution: search Google for any enemy in the game followed by the word ‘strategy’ and you’ll find pages of people on forums sharing their own tactics. On easy difficulty settings you can play Baldur’s Gate like an RTS, clicking on enemies and simply waiting for their health to deplete. But this is ultimately a boring way to play the thing. Every enemy is a puzzle to solve, and combining your party’s abilities to outwit and defeat them is a big part of the experience. And because of the sheer number of spells, classes, enchanted weapons, potions and enemies there are to experiment with, it’s rare to find yourself settling into any kind of routine. You have to engage with every big fight on a deep level, and that makes for a really satisfying RPG. Another product of the monster design is making the world feel genuinely intimidating. When you’re creeping through a dungeon, the fog of war unfurling before you, there’s a palpable feeling of dread. Your mind starts racing: what if there’s a beholder around this corner? Or a lich waiting in the next chamber? The dungeon designers often lull you into a false sense of security with skeletons and spiders, then suddenly spring a vampire or a group of adamantine golems on you. And that’s what a good dungeon crawl should feel like. Not like Diablo where you’re an almost unstoppable force, reaving effortlessly through waves of demons. You want to feel like you’re delving into some forbidden, cursed place, where danger lurks around every corner, but the twinkle of treasure waits at the end as a reward. By making every battle count, and designing enemies that you have to use your brain to defeat, BioWare achieves this brilliantly, in both Baldur’s Gate games. I’ll never forget the terror I felt the first time I saw a dragon. This approach to enemy design means that some battles are legendarily difficult. In BGII you can collect the body parts of a lich named Kangaxx, put him back together, then fight him. He has a 90 percent resistance to physical damage, can’t be damaged by anything less than a weapon with a +4 enchantment, and a ring that regenerates his health. This is one of the hardest bosses in the game, but players have found amusing ways to cheese it, such as casting Protect From Undead on a couple of fire elementals, sitting back, and letting them do the work. Yeah, it’s a cheap trick, but that’s all part of the appeal of Baldur’s Gate. You might be facing off against one of the most powerful, evil creatures in existence, but if you’re smart, you can come out on top. A legendary monster, and arguably the most challenging boss in the Baldur’s Gate series. You’ll find this beast in the Throne of Bhaal expansion, and to slay it you’ll need to make use of your party’s entire range of abilities. Before the battle you can have a thief lay traps, while mages can cast spells to weaken it. Even then, you are in for a gruelling, almost impossible, battle. A powerful dragon. If you rolled a paladin, one of your final duties is slaying him to retrieve the Holy Avenger, a legendary sword. Firkraag will cast Remove Magic on the party, removing everyone’s buffs. To make your life a little easier make sure you have a cleric who can cast Protection From Fire on the group and cast Stoneskin and Mirror Image on your best tank. Encountering one of these undead magic users is enough to make even a hardened adventurer defile their pantaloons. They’re immune to non-magic weapons and have a range of nasty spells at their disposal. They’ll cast Stoneskin and Spell Trap on themselves, making them almost invincible, but a few well-placed Arrows of Dispelling can weaken their defences a little. One of the most feared monsters in D&D. It can cast devastating spells, including turning you to stone, slowing you and dominating your mind. To take one down you need to make ample use of buffs such as Spell Shield and Haste. You can also temporarily prevent it from casting spells, or use the Shield of Balduran to block its magic. Beholders are always a challenge, and a total nightmare, to fight. 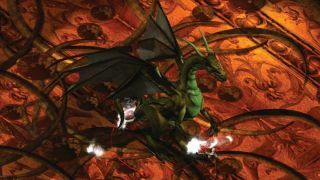 For more, read about how Baldur's Gate's characters have endured the test of time, and check out our piece on the genius of the Infinity Engine.